No way Dan Molenaar was going to miss his senior year. He has worked too hard, coveted too many friendships, dreamed about this too long to give it all up because of an injury. So Molenaar is playing through pain. The ankle injury that knocked him out of the Upper Midwest High School Elite Hockey League this fall might someday require surgery. Molennar says he's doing "everything he can" to be on the ice and not in an operating room. 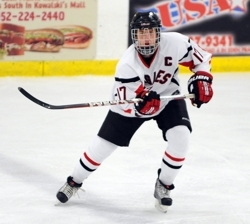 For now, the Eden Prairie senior defenseman seems to be “hobbling along” just fine. 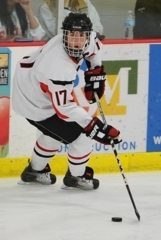 The smooth-skating Molenaar, showing no ill effects from his injury, registered five assists in Eden Prairie’s 6-3 season-opening triumph over Apple Valley on Thursday, Dec. 2, in front of a packed Eden Prairie Community Center crowd estimated at 1,100. 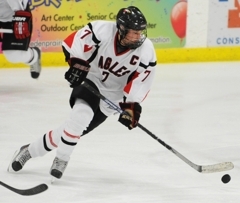 “Bad ankle, bad hips, but you can’t stop him,” Eden Prairie senior forward Luc Gurdes said. “He just moves the puck. 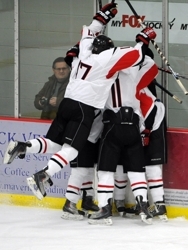 The 5-foot-11, 170-pound Molenaar assisted on Eden Prairie’s first four goals, then sprung Kyle Rau loose for a breakaway goal late in the third period. “I got some help on a lot of those,” Molenaar said. “I got some luck. Molenaar was especially pleased with Eden Prairie’s performance given that two of the team's top six forwards, Des Shavlik (knee) and Jack McCartan (shoulder), missed the game because of injuries. 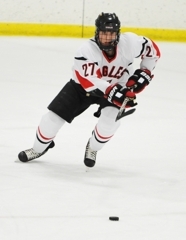 While Eden Prairie standout Kyle Rau had his typical big night (two goals and an assist) it was Molenaar who kickstarted the offense on numerous occasions with his ability to skate the puck past Apple Valley defenders and into prime scoring areas. With would-be defenders fully mesmerized, Molenaar then showed an uncanny ability to get the puck on a teammates’ stick. That Molenaar is even playing this season might be the biggest surprise. 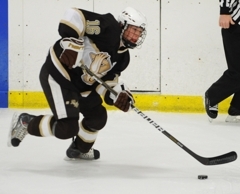 While Molenaar was an unstoppable force offensively, Apple Valley coach Jerry Hayes said he noticed “Number 17” more for a his work elsewhere on the rink. 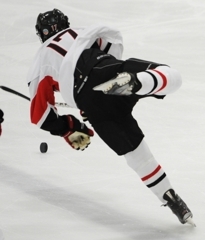 Who says star Kyle Rau is the only one who can score for Eden Prairie? The senior forward scored in the first period to tie the score at 1 and scored again 9:54 into the third to put Eden Prairie ahead 5-3. Both of Gerdes’ goals came as the result of crashing the net and staying on the lookout for loose pucks. 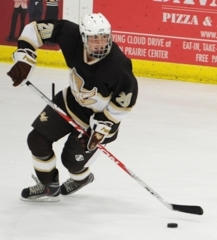 Molenaar, who missed the final half of the Upper Midwest High School Elite Hockey League season this fall with an ankle injury, still isn’t completely healthy. Oh well, all Molenaar did was register a stunning five assists, capping his night with a gorgeous pass that sprung Kyle Rau loose for a breakaway goal late in the third period. 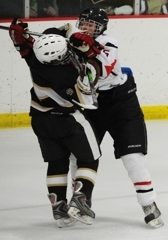 The towering (6-foot-2, 190 pounds) sophomore scored twice, missed on a breakaway opportunity and threw his big body around with abandon. 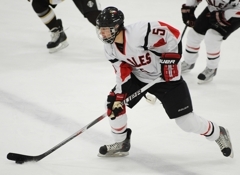 Eden Prairie’s Kyle Rau, David Rath and Luc Gerdes each scored twice to easily offset a big night from Apple Valley standouts Hudson Fasching and A.J. 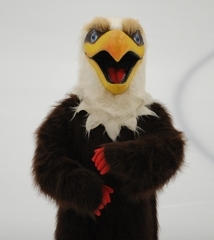 Michaelson and lead the host Eagles to a 6-3 triumph over the visiting Eagles on Thursday, Dec. 2, in front of a capacity Eden Prairie Community Center crowd estimated at 1,100. 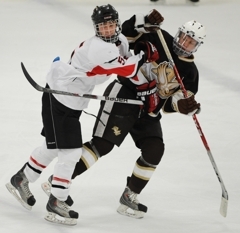 Gerdes, Rau and Rath each scored in the first period as Eden Prairie – playing without injured top-six forwards Jack McCartan and Des Shavlik – surged to a 3-1 lead. 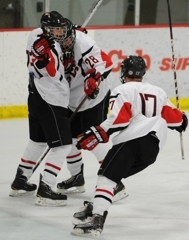 Michaelson and Fasching scored 1:23 apart in the second period to tie it, but Eden Prairie got a big momentum boost – and the lead – with 28 seconds left in the third period when David Rath scored a power-play goal to put Eden Prairie ahead 4-3. Gerdes and Rau scored in the third period, and Rau’s breakaway goal with 5:42 remaining sent some members of the large Apple Valley cheering contingent to the parking lot. Dan Molenaar, who has been recovering from an ankle injury he suffered while playing in the Upper Midwest High School Elite Hockey League this fall, assisted on all but one of Eden Prairie’s goals. 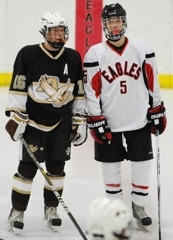 Fasching, a sophomore, scored two goals and Michaelson, a junior, had a goal and an assist for Apple Valley. 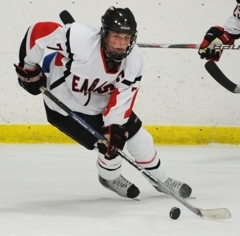 Rau had two goals and an assist for Eden Prairie. 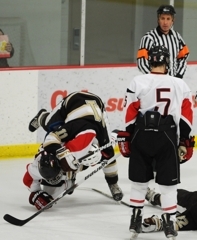 Eden Prairie goaltender Andrew Ford stopped 20 shots while Apple Valley goaltender Aaron Gretz turned aside 27 shots.